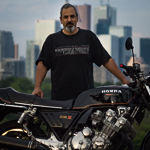 The International CBX Owners Association • View topic - How do you feel about the dangers of riding? How do you feel about the dangers of riding? I think that this is a topic that a lot of us (especially older riders) think about, and discuss to some degree - but for some reason it's top of mind for me these days and I thought I'd see if we can have a healthy discussion about it. I have been fascinated with bikes for literally as long as I can remember. The first drawing I can remember making was an Evel Knievel-ish figure jumping a motorcycle over some cars. I would have been about 5 then, so we're talking about almost 45 years of obsession. Despite that, I didn't get a bike of my own until I was 29. And my god - it was everything I had always dreamed and hoped it could be (except that I was way worse at stuff like wheelies & getting my knee down than I expected/hoped). Through long and somewhat difficult periods of my life, I found that buying, maintaining, modifying, and riding motorcycles was my single greatest pleasure. Some of the absolute best experiences I've had in my life were on a bike. I work in IT writing software for capital markets and it takes a sustained effort to focus my attention away from bikes so I can get work done (which I'm obviously failing at right now). I can't count the number of times I've had a sleepless night because I had an idea for a bike that got me too excited to be able to rest - or because I saw something so exquisite done by someone else that it just set my brain buzzing uncontrollably. All this to say something that I believe everyone here has felt plenty of times. I don't think I'm special in this regard. For a long time, I rationalized the risks associated with riding a few different ways. It would be stuff like "Sure, motorcycles have the worst passive safety of any vehicle on the road, but they have the best active safety - so I don't think that the overall risk is higher". Or I'd wave off mortality statistics with stuff like "Look, the worst daredevils will naturally be drawn to bikes because they're the most extreme. The statistics are heavily biased by people who are the most irresponsible road users." Or "Riding is about managing risk. You make those choices on a second-by-second basis with your right wrist." One way or another, my thinking boils down to "If I have the right amount of care and luck, I can do this my whole life and not get badly hurt or worse". Right now, I'm finding that "If" at the beginning seems awfully heavily loaded. I kind of feel like my head is telling me that it's time to give up the street and learn to love riding dirt or trails - or even try trials (although I don't think I have the aptitude - it might be fun to do it with my kid). But honestly, the thought of never going out and hitting the road again leaves me feeling a bit overwhelmed. It's a big decision, and I'm not asking anyone to make it for me, but I am curious to hear how others have managed or thought through these questions. Re: How do you feel about the dangers of riding? I wasn't sure If I should reply to this or not but maybe some might find it interesting. I will be 75 years old in February and still cant wait for spring to arrive to get the CBX out again. I have been riding since I was 16 years old and have had a lot of injuries, the last was the worst when I was critically injured (not my fault) 6 years ago but the Toronto Sunnybrook trauma hospital put me back together again with metal and screws. Unfortunately the same could not be said for the Ducati 1098 that I was riding. If you had asked me when I raced in the Irish road races during the 60's if I would be still riding at 74 I would have laughed because I didn't realise that this disease of riding a motorcycle would never leave me. Yes, motorcycling is very dangerous especially when you consider the number of brain dead morons that are driving cars out there but I'll still take my chances. I do everything possible (ATGATT) to mitigate the risk, and make sure the ride is in mechanically safe condition. Further, no alcohol while riding (or excessive the evening prior). I read a lot on improving practices and techniques, and put them to use on the road. A couple of track days really helped with the confidence level, which lowers the fear level. The simple story is ride within your limits. I don't have a #1 plate on my bike and won't pretend to. I love motorcycling and will never stop. The freedom and relaxation of a good ride trumps anything else I have ever experienced. I follow this simple rule when giving advice to anyone about the risks of riding - if you love motorcycles and riding - it's worth the risk. If you don't, then walk away. I've been riding since I was 14 and I'll be 64 next month. I've had one street get-off, when I was in my early 20's and was very lucky to walk away. Motorcycles were my passion by then and I continued on, to this day. That said, as we get older, we get a bit more introspective. You have a young family to consider, live in a very congested metro area and will have many priorities other than bikes while raising your family. My kids are both long grown and gone - both have ridden and know how to ride, but do so no longer, and never will, I'm secretly happy about this, see above. I kept my hobby fairly active through raising the kids and was fortunate to have a spouse that enjoyed riding (as a passenger only) too. She still does, and some of our most memorable times and trips have been on a bike. I've made countless friends for life that I never would have met otherwise. Vintage motorcycling is probably a halfway compromise to this risk issue. I have found I get just as much, or more, satisfaction from restoring and gently riding CBXs and BMWs and attending vintage events where a little riding and a lot of talking and tire kicking take place. It's what many of us will be able to do as we age. Risk is minimized and we are still immersed in the motorcycle culture. The only modern bike I own is the GL1800. Everything else is vintage and gets ridden relatively little, but with great enjoyment. It is ultimately your decision, certainly it can be agonizing, but you need to do what is right for you and your family. I don't give much (if any) thought to the danger aspect. Like Dave, I've been riding for about 50 years and (for the most part) got my stupid out a long time ago. I ride somewhat less than I used to, but still quite a bit and I definitely have more sense. You either feel like riding or you don't. If you feel it, you accept the risk. I feel it. I look forward to each and every ride - even if it's just to work. I still feel the jolt of adrenalin (or something) just knowing I'm about to go out. The funny thing is, I think I feel it as strongly as I did lo those 50 years ago on a Hodaka B+. If that's not enough, I don't think I'd ever have a circle of friends that could compare to what I have today if not for motorcycling. I will ride until I don't feel like it any more. I don't think that'll be happening anytime soon - God willing. It seems the risk to enjoyment ratio of any activity stays fairly constant. Want to peg the fun meter? It will have an element of risk. I, for one, don't want to spend my life watching the news and fretting over things I can't change. Know your risks, and take steps to mitigate them, but enjoy life. rode while we were raising them. I also ride sleds (snowmobiles) in the mountains in and around avalanche conditions. if I want to see tomorrow and still be able to ride. Its a tough topic but I commend you for taking the time to evaluate. stopped riding for a long while after I was married, never thought about my kids being without their dad I just couldn't afford to ride with four kids and a mortgage, some other expense always had priority for cash so the bikes sat. I had many many many dismounts on my dirt bikes nothing too serious, my brother was nearly killed MX racing...I never went back to the dirt after that. Since I've been riding the streets again I'd estimate I have at least one close call every 2-3 months. I live in a city of 1.25 million so traffic is high, idiots in abundance...I try stay out of high traffic periods and avoid the central freeway kill zone as much as possible...Mouse hates coming into the city, I understand his nervousness compared to the light traffic in his mountain valley...conversely those roads through the forests make me nervous, geese, horses, moose, elk, deer, bears, mtn goats, coyotes, rabbits I've had encounters with all of them, not something I like to see in my lane when I'm coming around a corner at speed...half of those critters I've encountered in the city! lights to the old bikes but they don't get ridden on a daily basis or for touring. It would appear our biggest problem with cars/trucks is being seen. As a kid my passion was always for motorcycles but my parents never allowed one. Once i started driving cars, this passion switched. That all came back about 20 years ago when i bought my first bike and i'm absolutely crazy about them. I'm also aware of the dangers so i minimize it by not commuting on one. I keep riding for the weekends to San Diego's back country roads. And sure, i do briefly get them top the red line sometimes but only occasionally. For the most part, it's always leisure ride. My CBX and Triumph are keepers and i always have a third as a winter project which i usually sell in spring. As Wyly has mentioned I really dislike riding in city traffic. Although getting hit from behind by a hit and run driver and spending three days in hospital (due to internal bruising) did not put me off riding it did made me more cautious as to where and when. I did see a riders lighting set up in October that I'm going to emulate. A bright YELLOW! LED fog lamp on each side of lower crash bar, he was very visable. An interesting topic and one that I, for the longest time, avoided talking about or even risking thinking about just in case it made those around me more against bikes. I did various courses and always wear the gear, ATGATT, to improve my chances of not having an accident and to mitigate the outcome if I do. Most people that don't ride bikes seem to think they are coffins on wheels, accidents waiting to happen. These guys think I'm crazy to ride my bike to work every day, rain or shine. Some years back I bought a book by David Hough, Proficient motorcycling. One of the first topics was about accident stats - the taboo! It was a very interesting read and knowing the most likely scenarios that result in bike accidents certainly helps one to recognize these on the road and hopefully take the necessary action early enough. I've been lucky regarding accidents both on and off road. A few years back I was riding a mountain pass on my CBR1100XX behind a friend of mine local to the area. I felt I was a better rider than him so was running through the corners quicker than him, letting hike get away a bit on the straighter parts. I'm not really sure but perhaps I wasn't as focused as I should have been but I entered a corner a bit too quick. I remember calmly thinking I'm a bit quick, closed the throttle and leant the bike more. Next thing I knew I had stood the bike up and was on the brakes, screaming at myself in my helmet (WTF am I doing)! Next thing I was lying on my back in the road. I had clipped a car on the exit, don't ever remember seeing it. I got off lightly with only a badly strained groin thanks to top notch gear. I will never forget my young daughter's face and her instant tears when she saw me on crutches after I was discharged from the hospital. Puts "the fun" into perspective. Sure, I still ride fast but I know I have nothing to prove to anyone. I ride for my own enjoyment. if I feel there is too much risk, I take it easy. Often on my commute I get guys who go through traffic quicker than me. I just move aside, I'll get there. Taking a chance is just not worth the risk. I reckon we must have some of the worst, most selfish and unskilled drivers in the world with some scary unroadworthy vehicles and this must heighten the risks for all road users. Like many have said, I've met a bunch of people who will be friends for life through riding bikes. Remembering what's important to you helps put every ride in perspective . and interesting topic. Also hesitated to chime in for the same reasons, but Mello, you nailed it. All those who went thru crashes & injuries know the consequences, good and bad. I sure learned from it, it made me a better rider, but as I get older, survival and preservation are top priorities! Mind you being older do's not always equate with being wiser. A few years back a local X-bike racer decided to teach some wanna-be bike hooligans a lesson in "real" bike handling. Seems that the young wanna-be hooligans had been bragging for a few weeks about their abilities ripping through a series of S bends on a local road. Said X- racer saw them and their friends heading out one day, so he jumps on a buddies modified Ducati 996 and follows them. Sure enough the wanna-be's decide to do a run through the S bends and the X racer proceeds to pass all of them one by one in the various bends, going under or around them all. Que a local police officer who had also seen the wanna-be's heading out and who set himself at the exit of the last bend. The X racer got clocked doing 145 kph in a 60 kph zone, lost his license for 5 years and had his wife make him sell his bikes on pain of divorce if he did'nt. The kicker in this tale .... X racer was in his late 60's at the time. Now in his 70's he is back riding again but only on a 72 Honda 500 4.